Know Crescenta Valley Class of 1965 graduates that are NOT on this List? Help us Update the 1965 Class List by adding missing names. Reunion Picnic - Classes 63 thru 68 at Crescenta Valley Park (Hindenburg side) on August 24, 2013. Please bring your lunch, beverage and memories. Casual get together to re-live old memories and connect with old friends. 11 to whenever. Hope you can come. More 1965 alumni from Crescenta Valley HS have posted profiles on Classmates.com®. Click here to register for free at Classmates.com® and view other 1965 alumni. 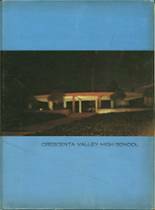 The students that went to school at the La Crescenta high school called Crescenta Valley High School and graduated in '65 are on this page. Register to add your name to the class of 1965 graduates list.